[19:33] <+Daniel-Myythic> I’m Daniel Watters, CEO of Cactyys Totem Entertainment, LLC. We are Kickstarting an Advance Rulebook for our first game called: Myythic – The Buried Temple of Alimar. [19:34] <+Daniel-Myythic> Just a disclaimer, I do know that another game exists called Mythic as well. [19:34] <+Daniel-Myythic> In 2013 I talked to that author and we discussed that our two game are 100% different. Why? Myythic and Mythic run without a Game Master. [19:36] <+Daniel-Myythic> The core rules shows players how to play without a GM and a new combat system that, as far as I know, has never been used. The advanced rules now focus on the Role-Playing side of the game more then the core rules. [19:36] <+Daniel-Myythic> I’m sure you have questions about both the core and advanced rules. Anyone have any? [19:34] <&TimKirk> Hi, my name is Tim Kirk, and I’m currently in the final phases of Hearts & Souls a 2nd edition. A superhero game with a different, ahem, drive. [19:35] <&TimKirk> It’s focus is on creating the soap opera drama, inner conflict, and story elements that make superhero games about more than powers, costumes, and violence. [13:33] <+PhilG> Hi, Phil Garrad. Nick and I have written Everywhen – a high action adventure RPG based on Barbarians of Lemuria. [13:34] <+PhilG> Everywhen uses the BoL rules to provide a game that’s very adaptable to any setting. [13:34] <+PhilG> Particularly suited to high action, pulp gaming. [19:30] <+Marco_JAGS> JAGS is a universal system (Just Another Gaming System) and is found at w(Link: http://www.jagsrpg.com.)www.jagsrpg.com. [19:31] <+Marco_JAGS> with mutants, all kinds of crazy weapons and armor, destroyed mega-cities, bizarre monsters, and no small amount of humor. [19:31] <+Marco_JAGS> (well, as humorous as we could be). [19:31] <+Marco_JAGS> That’s the high-level–I can talk about specifics as wanted. [19:45] <+bebarce> Hi my name is Bebarce El-Tayib, I’m the developer of a game called Power Outage. 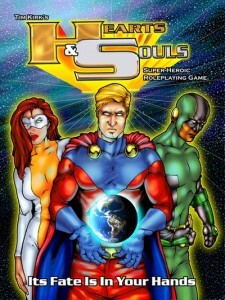 [19:46] <+bebarce> Power Outage is a super hero themed tabletop roleplaying game designed for kids and adults.